Many of the most valuable dimes on this are from the early 19th century which was a time when the dime, like the United States Monetary System, was very young. The dime was the first coin made by the United States Mint, starting in 1796. While dimes are essential collector items in the numismatic community, they don’t seem to share the same broad spotlight that pennies and silver dollars do. But that can be good news for dime-crazy numismatists who are able score great deals on scarce coins that may cost a fraction of what other similarly rare pieces may go for in the coin market. 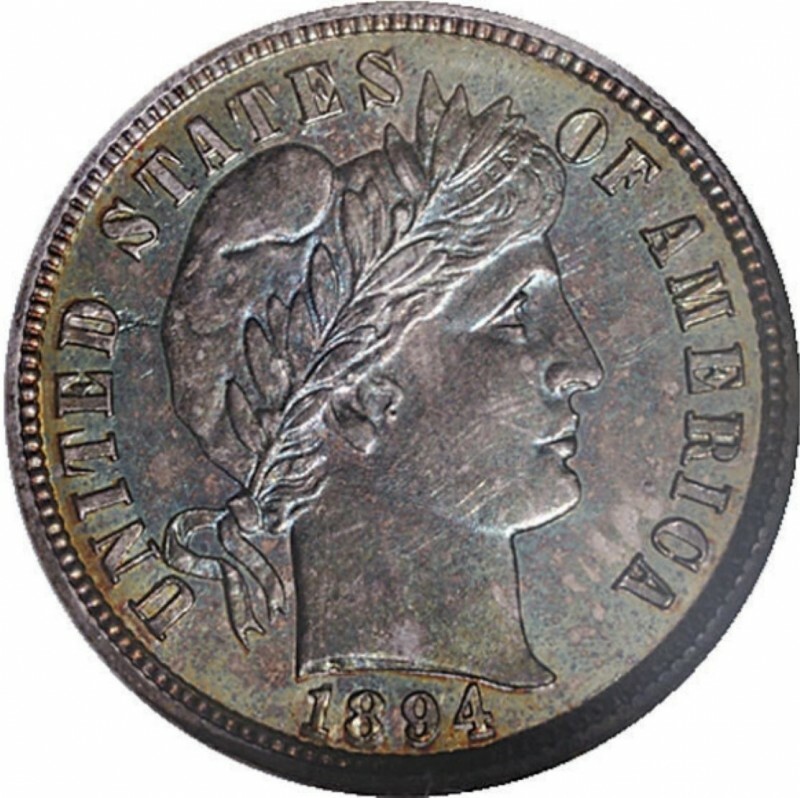 For example, many Seated Liberty Dimes – such as the 1846 or any of the 1850s San Francisco Mint pieces – have very small mintage figures (100,000 or lower), yet can be bought for well under $200 in a grade of Good-4 on the Sheldon Grading Scale. Both the Barber Dime and Mercury Dime series are among the most popular dimes collected. While very few representatives of either of those two series pop up in this list of most valuable dimes, there are indeed several scarce issues from each of those two series, and they are indeed numismatic treasures. There are even a couple of Roosevelt Dimes that appear in this list of most valuable dimes, however those modern rarities are two proof issues that lack their San Francisco “S” mint mark. Otherwise, there are no regular-issue Roosevelt Dimes on this list, though a few issues are considered fairly scarce in the scope of that high-production series and are worth a fair chunk of change more than face value. Unless otherwise noted, all the issues listed among the most valuable dimes have prices corresponding to specimens in a grade of Good-4. 1894-S Barber Dime: $1.9 million – This much-storied Barber Dime derives from a small batch of 24 proof dimes that were made as gifts for friends of the San Francisco mint superintendent. He gave three 1894-S dimes to his daughter, and she later spent one on a dish of ice cream. Today, just nine specimens of this coin exist, including two circulated specimens. The most valuable 1894-S Barber Dime, referenced here in this list of most valuable dimes, is a proof specimen. 1829 curl base “2” Liberty Cap Dime: $7,750 – This die variety may not attract much attention from type coin collectors, but is nonetheless a rare and expensive variety that some financially well-heeled numismatists will gladly spend thousands to buy. 1968-S, no-S proof Roosevelt Dime: $7,500 – The first proof coin that was accidentally struck without an “S” mint mark, the 1968 no-S Roosevelt Dime is a modern rarity that tickles the delight of many numismatists. A few dozen examples of this coin are known to exist, but what are oddly absent are mint records detailing the origins of this coin. 1874-CC Liberty Seated Dime: $5,000 – All Carson City Mint coins are considerably scarce, but this one takes the cake for dime collectors. Of the 10,817 that were originally minted, a tiny fraction of 1874-CC dimes still exist today, with most having been spent in the Carson City area upon their release and lost to the effects of time. By far, the 1874-CC is a top regular-issue key date for the Seated Liberty Dime series. 1797 Draped Bust Dime: $3,000 – All early dimes are rare, and the 1797 is no exception. 25,261 were minted with two major die varieties – one featuring 13 starts and other 16 stars. Both are worth roughly the same amount, though few numismatists who buy 1797 Draped Bust dimes are worried about the die varieties, since these are by and large bought and sold as type coins. Since all coins were minted at Philadelphia in those early days, there are no mintmarks displayed. 1796 Draped Bust Dime: $2,850 – The first-ever dime officially made came along in 1796, and this piece is a collector favorite for all the reasons you would assume: it’s historic, it’s the first dime, it’s old, and it’s rare – only 22,135 were originally made, and far fewer survive today. 1804 Draped Bust Dime: $2,650 – There are two varieties of 1804 dime; one features 13 stars and the other 14 stars. The 14-star variety is scarcer today and commands prices that are $2,000 to $4,000 more across the board than the lower-priced 13-star variety. Both varieties are scarce, as only 8,265 dimes were made in 1804 in total, and few of those survive today. The lower-priced, slightly more common 13-star 1804 dime is referenced above for a specimen grading Good-4 on the Sheldon Grading Scale. 1798/97 Draped Bust Dime with 13 stars: $2,150 – This overdate variety is popular and scarce, costing about twice as much than a standard 1798 Draped Bust dime, of which 27,550 dimes were made that year across the board. Generally, all early dimes are collected by type rather than variety. 1871-CC Liberty Seated Dime: $2,000 – Another Carson City Mint issue from the 1870s shows up in among the Top 10 most valuable dimes on this list. All Carson City coins are scarce, and the 1871-CC is one of the regular-issue key dates of the Seated Liberty dime series. Just 20,100 pieces were struck at Carson City that year, and most faced extreme wear. Few survive today. 1802 Draped Bust Dime: $1,750 – Draped Bust dimes are highly popular with many type collectors, and the 1802 dime is a rare breed indeed, with just 10,975 originally made. A fraction of these coins survive today, and they are highly treasured in all grades. The 11th through 25th most valuable dimes in this list include several pieces that are more familiar to modern coin collectors, including the 1916-D Mercury Dime, a key-date Barber Dime, and even another Roosevelt Dime. All prices for these coins below correspond to specimens grading Good-4, unless otherwise noted.